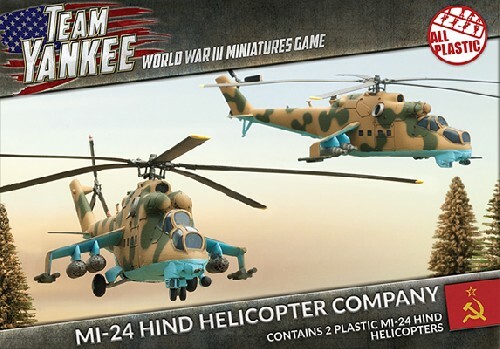 Includes two Mi-24 Hind helicopters, two plastic flight stands, eight rare-earth magnets, two unit cards and decal sheet. The Mi-24 Hind is a large helicopter gunship, attack helicopter and low-capacity troop transport with room for eight passengers. It is produced by Mil Moscow Helicopter Plant and has been operated since 1972 by the Soviet Air Force and its successors, along with more than 30 other nations. Soviet pilots called the Mi-24 the "flying tank"